Utrecht, 1682. Map of the north east states of the USA, and Canada, based on Sanson's map of 1657. The Great Lakes are shown open-ended in the west. Paris, 1705. Map showing from Florida to Panama, marking Santa Fé and showing the southern tip of the island of California. Paris, 1705. Map of the Gulf Coast of America, with the discoveries of La Salle, 1682-4. Paris, 1705. 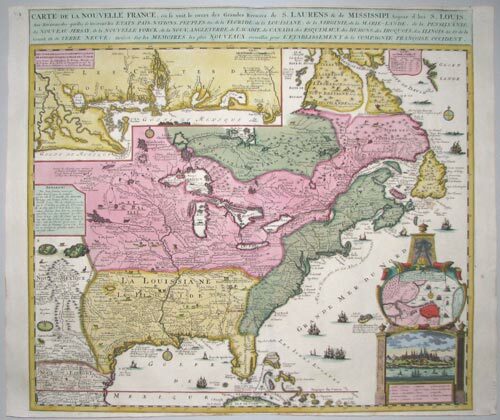 North America east of the Mississippi, showing the discoveries of the French explorer la Salle around the Great Lakes and the Mississippi, 1682-4. Nuremberg, c.1720. 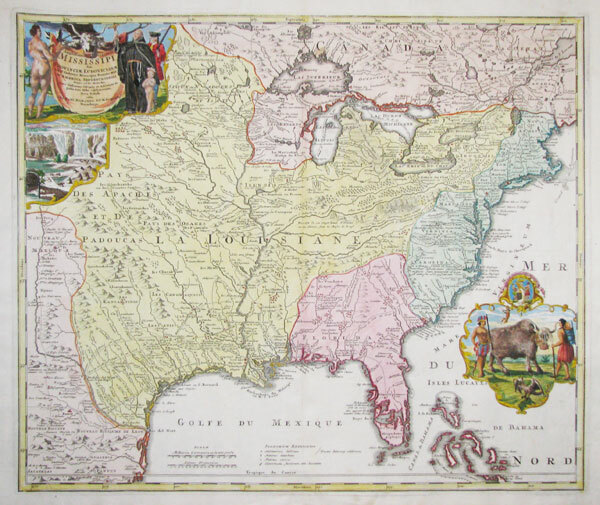 A large and colourful map of central North America, published to illustrate the work of Father Louis Hennepin (1626-c.1705) a Franciscan who travelled through French North America wilth La Salle 1675-9, crossing the Great Lakes to the Upper Mississippi. His account of Niagara Falls (illustrated here under the title) brought them to the attention of the European public for the first time. Hennepin's portrait decorates the title cartouche. Bottom right is a vignette illustration of an Indian family, with a bison. Amsterdam, c.1745. 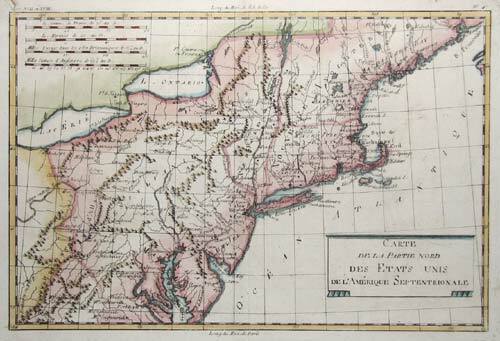 A very decorative map of eastern North America, with inset map and prospect of Quebec, the foremost French settlement of the period. Another shows the Gulf coast at the mouth of the Mississippi. Augsburg: Tobias Conrad Lotter, c.1750. Seutter's German version of the Jansson-Visscher 'Nova Belgi' map, as published by his son-in-law, updated to reflect the political reality of Britain's control of the area. The view of New York is the 'Restitutio' view, celebrating the short Dutch re-occupation of the city 1673-74, but instead of Dutch allegory the cartouche shows tribute being offered to George II of Great Britain. Augsburg, c.1760. 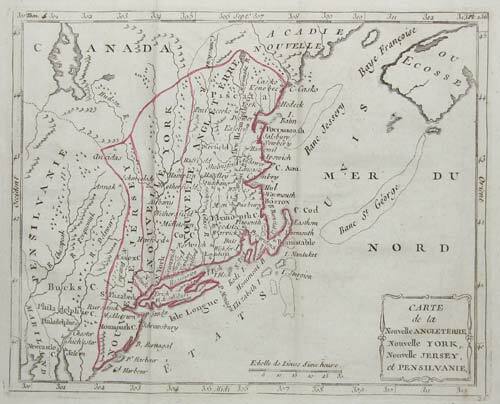 The Eastern Seaboard, divided into the Thirteen British Colonies, but also showing Lake Michigan and James Bay, published just prior to the Revolution. 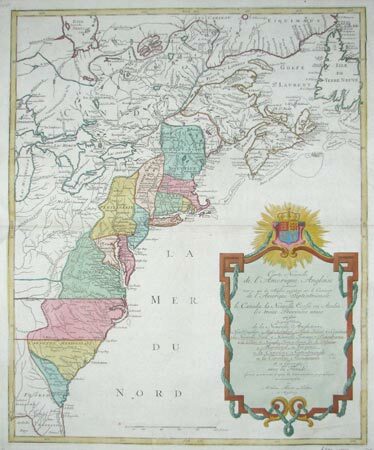 The Atlantic is filled with a large title cartouche, listing the provinces. London, c.1763. 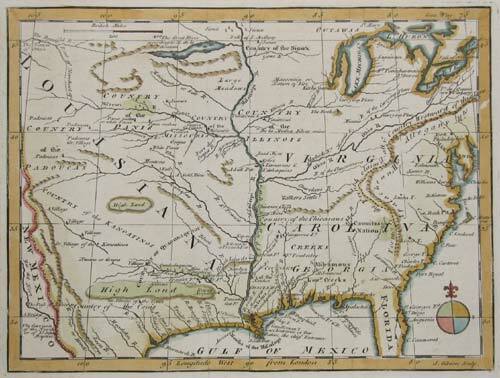 Centred on the Mississippi, an unusual map published just years before the Declaration of Independence. From the Great Lakes to Florida and extends west of the Mississippi as far as Texas and Louisiana. Native American Indians areas named. Paris, Dezauche, c.1782. First issued in 1718, this map was the first printed map to show Texas ('Mission de los Teijas etablie en 1716'), and the first to depict the routes of the early explorers like De Soto in 1539-40. This final state has been updated to show the boundaries of the British Colonies, a year before Britain recognised their independence in 1783. Also of interest is the depiction of Florida as an archipelago rather than a peninsula. Paris, c.1790. 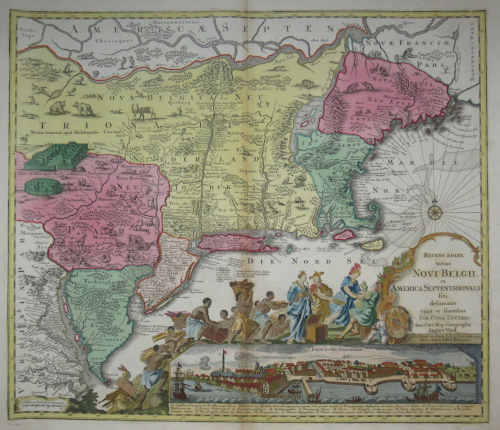 An unusual variant of Bonne's map the northern States. London, c.1790. 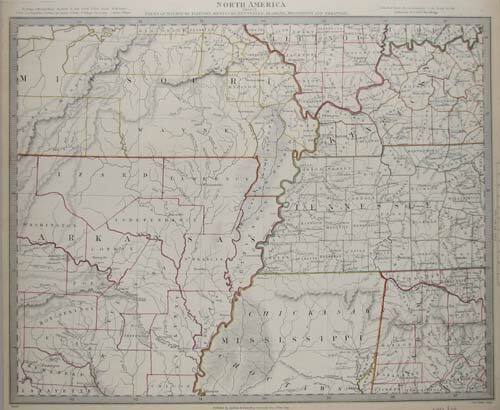 Map of the 15 numbered states, 'Army Lands' in northern Tennessee, and the 'Twenty Leagues Line' off the Eastern Seaboard. Venice, 1800. 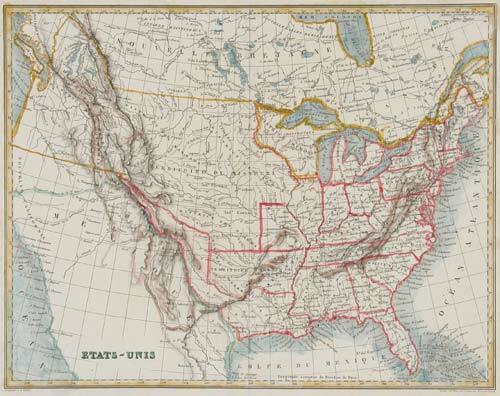 An unusual later edition of Zatta's map of the United States, dated 1800 but still showing pre-Revolutionary cartography. Edinburgh, 1814. 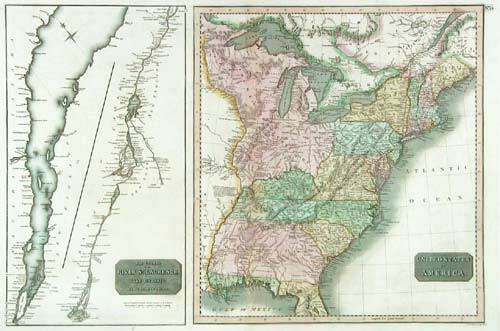 Two maps (United States and St. Lawrence river) on one sheet. London: Baldwin & Cradock, 1833. Map of the eastern parts of both Carolinas. London: Chapman & Hall, 1833. 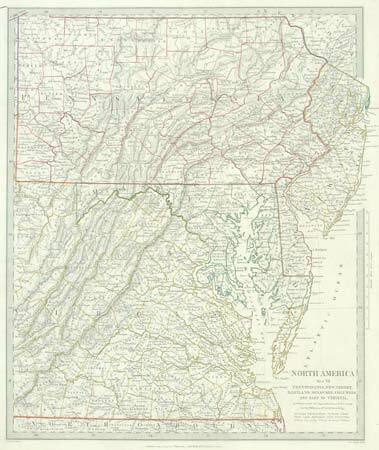 Map of Pennsylvania, New Jersey, Maryland, Delaware, Columbia and Part of Virginia. 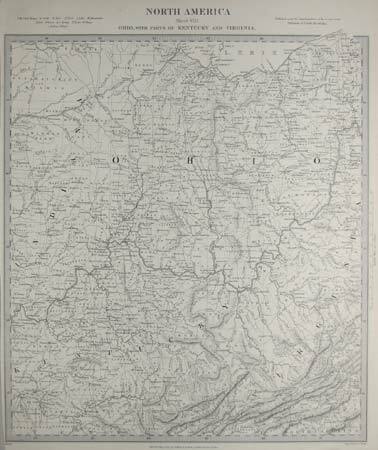 London: Baldwin & Cradock, 1833.